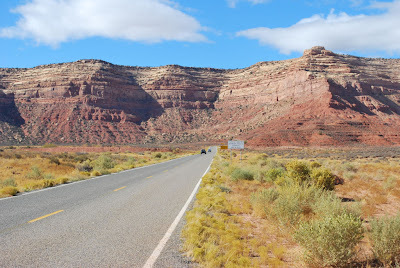 Returning from Utah to the Twin Cities, we took the southern route, mostly via Interstate 40. 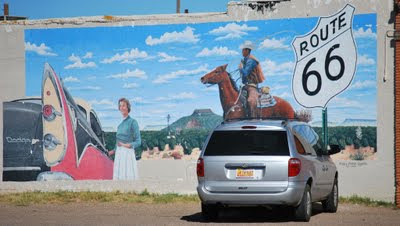 I-40 largely follows the old U.S. Route 66, celebrated in song (check out the Nat King Cole version from 1946) and a popular television series of the early 1960s. 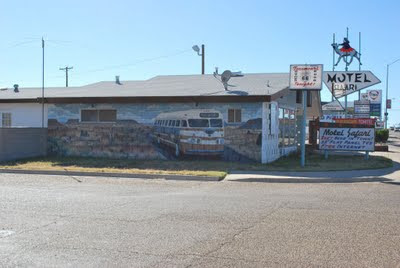 Named "The Mother Road" by John Steinbeck in Grapes of Wrath, there remain a multitude of landmarks and reminders of "motoring west" in the 1950 era. 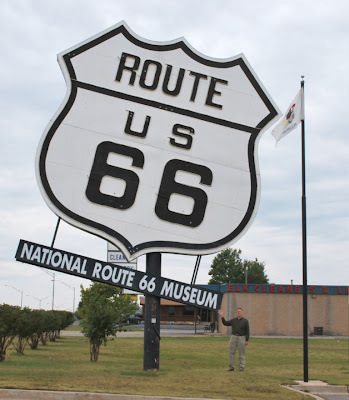 To do a decent "Route 66 tour" would take weeks. 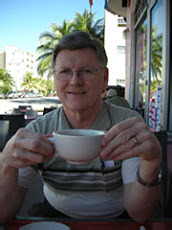 There are websites and detailed maps available if you want to give it a try. 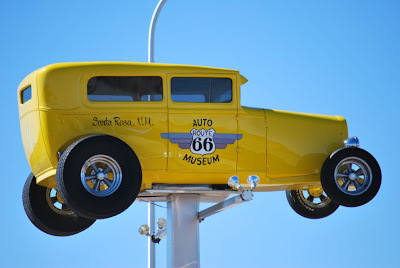 Just visiting the Route 66 museums that we stumbled upon would have added three more days to our trip. 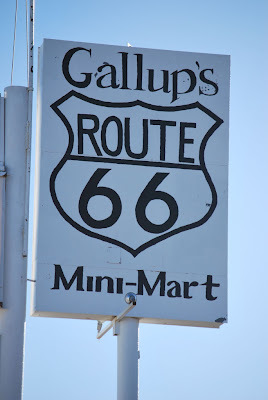 The first Route 66 city we hit was Gallup, New Mexico. 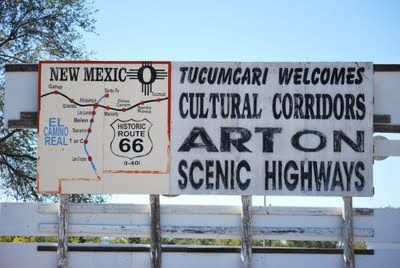 As we left the Interstate and drove into town in the evening we noticed the signs. 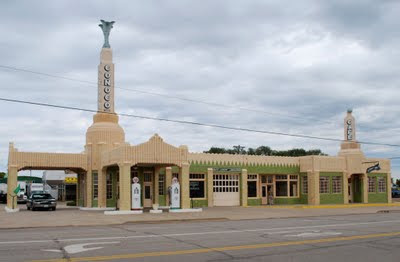 Route 66 was really about gas stations, motels and restaurants. There are plenty of them on the preserved sections. 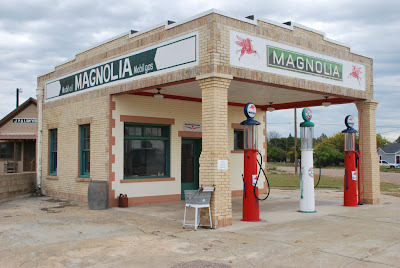 Even the modern gas stations and convenience stores want to grab a bit of the nostalgia. Moving along to the east the next morning, we pulled off at Santa Rosa and saw a couple of reminders of the association of cars with The Mother Road. 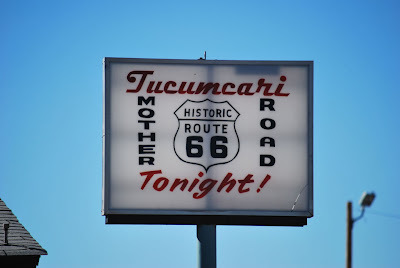 Later we pulled into Tucumcari. 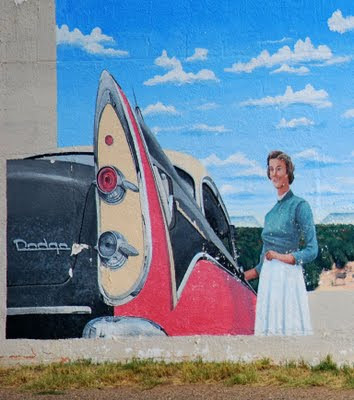 Here the chrome of 1950s cars has been stylized and memorialized. 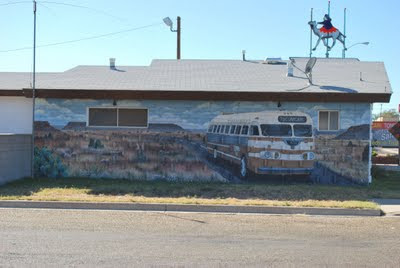 A series of murals can be found on several buildings. 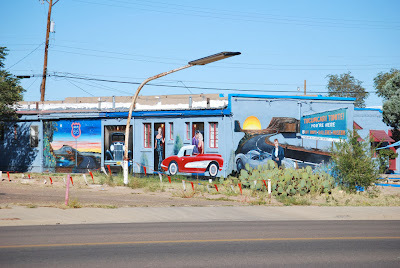 The Blue Swallow motel hasn't changed much in fifty years. Oh, sure, they have high-speed internet now. But it is still the same basic place built in 1939. 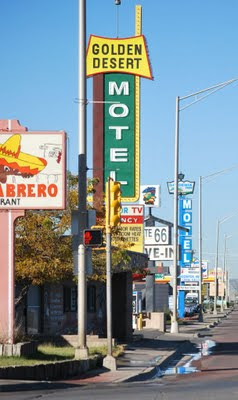 "The Friendliest Motel on Route 66." 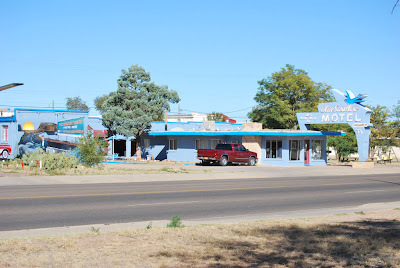 And how about staying at the Motel Safari? It's a relative youngster, built in 1959. When I saw that Trailways Flexible Clipper painted on the side, I flashed back to John Steinbeck's The Wayward Bus. Or maybe it was to Jayne Mansfield and Joan Collins in the movie version. 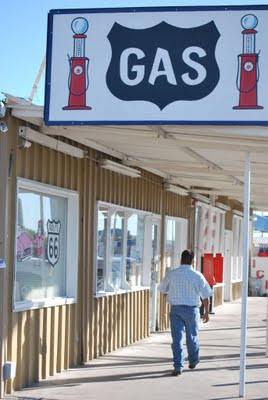 I only spotted that bus on the wall of the Safari because I had driven around the block to get a picture of this shop. Nails done on one side, Loans made on the other. 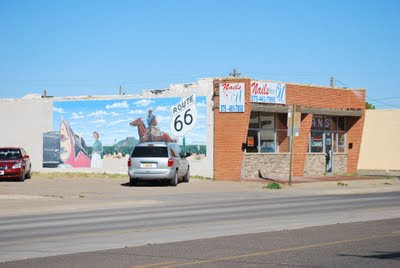 Say, is that a 1956 Dodge on the wall by the cowboy? I'll bet it was inspired by the 56 Dodge Owner's Manual. That car is getting its own post - it was my first car! Some of the nostalgia is a bit worn. 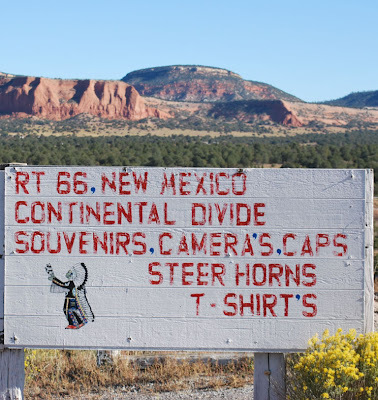 But even if you are in a hurry, plan to devote an extra day or two just to chasing the Mother Road sights. 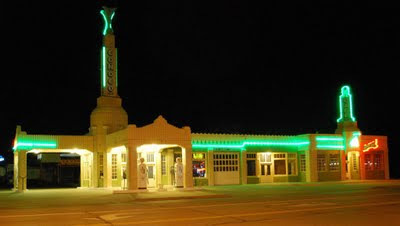 We stopped for the night on Thursday at Shamrock, Texas. Shamrock has multiple claims to fame. I'll only mention two. Then, there's the matter of that water tower. It's not just any old water tower. 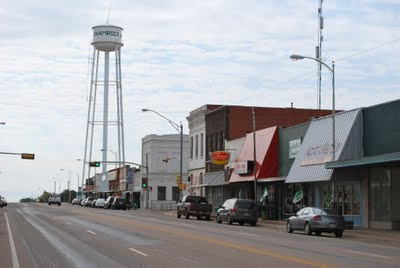 It's the tallest riveted water tower in the State of Texas. Now many towns would put the plans for such a tower, the pictures of construction and the like in a stuffy old museum that wouldn't draw much of a crowd. 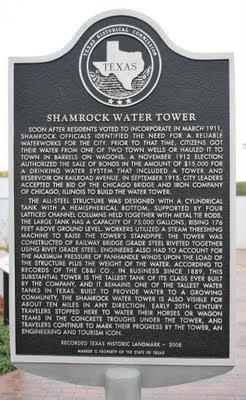 But Shamrock lays it all out in a series of displays at the base of the tower. 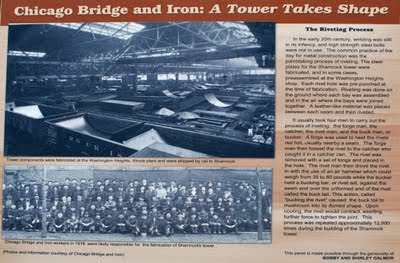 If you're a boilermaker or just an admirer of "The Bridge" (CB&I type), this town is a must see. O, yes. 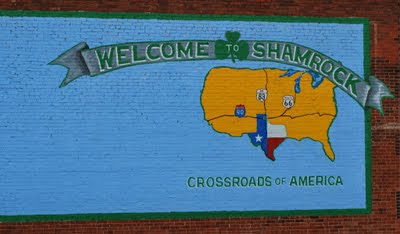 Shamrock also notes that is is the Crossroads of America and has a few other "Route 66" memories to share. 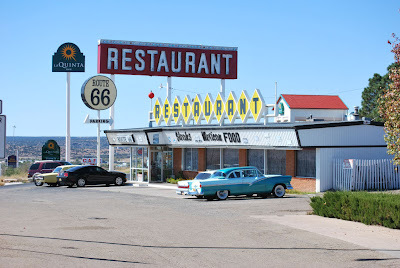 And while you are in town, stop for a meal at Big Vern's Route 66 Steakhouse. The steaks are great, the chicken-fried steak is superb and Vern and his wife are wonderful hosts. 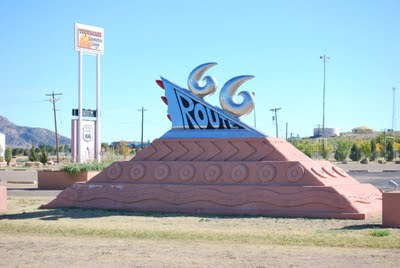 That's the description that you see on a large sign as you approach Groom, Texas along I-40. 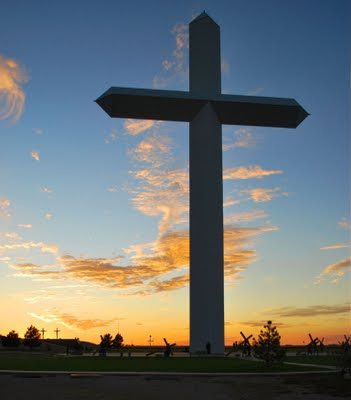 It answers the question that has formed in your mind as you have been driving the past few miles, seeing the cross but notice that you are not getting very close. It isn't the largest any longer - maybe not even second largest. But at 190 feet tall, it does get your attention. And in the setting sun, it forms quite an image. We stopped to take pictures. Here, Linda is standing at the base to give you some perspective. 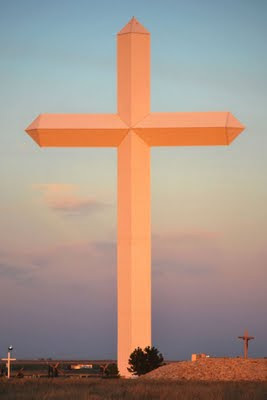 The cross was erected by the Cross of our Lord Jesus Christ Ministries. They have constructed a life size set of Stations of The Cross around the base. 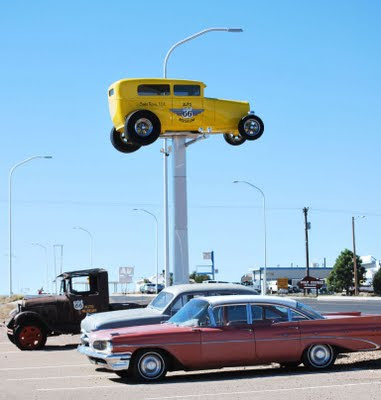 Hey, it's no Carhenge, but this display of "planted" Cadillacs along I-40 near Amarillo, Texas still catches the eye. We stopped, of course. Just to get a closer look. 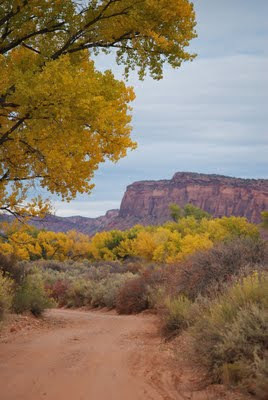 Utah has spectacular natural scenery, with most of it protected in National and State parks. There are so many of these that it took us two trips to see them all. 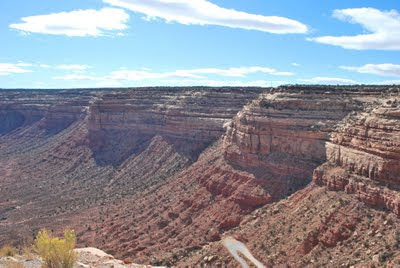 We toured the western parks - Bryce Canyon and Zion a couple of years ago. 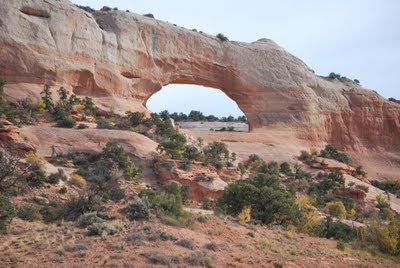 This trip focused on the Eastern parks - Arches, Canyonland and Natural Bridges. Once you are down, take a look back. 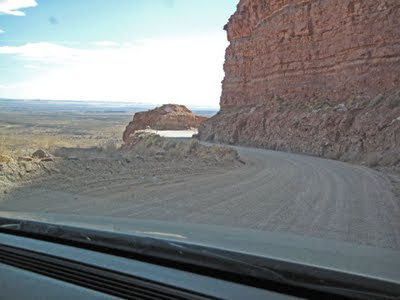 It looks like the road drives straight into the bluff. 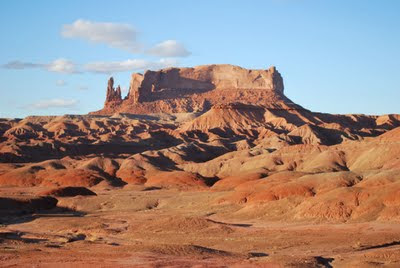 At the base, you could take a side trip into Valley of the Gods. 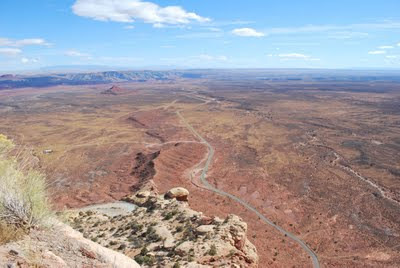 To ride a motorcycle to the top of Moki Dugway, try this YouTube Video. For an exciting ride back down from the top in a semi, try this YouTube Video. 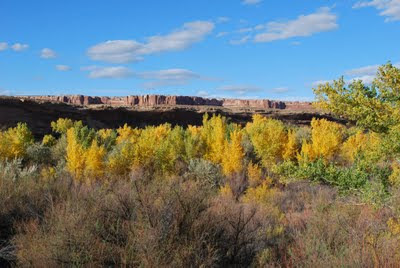 Somewhere between the eastern slopes of the Rockies in Colorado and the canyons of Utah, the yellow-leafed trees changed. 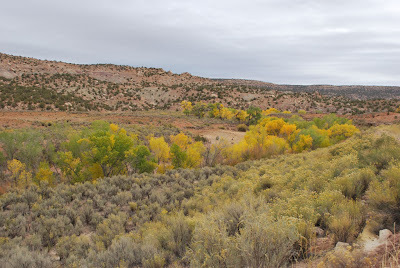 The beautiful Aspens disappeared and beautiful Cottonwoods took their place. 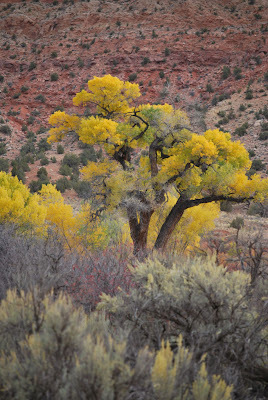 These are a bit different than the Cottonwoods we find at home, they are Fremont Cottonwood trees. But more often, they were an indicator of water, lining the streams. 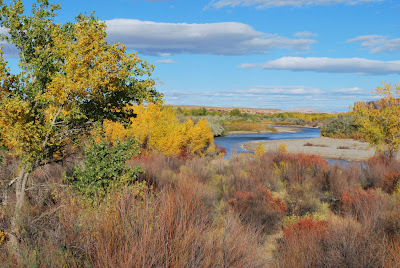 This made them a welcome sight to the early pioneers crossing the area. The trip out to Promontory Point described below does have one additional attraction. 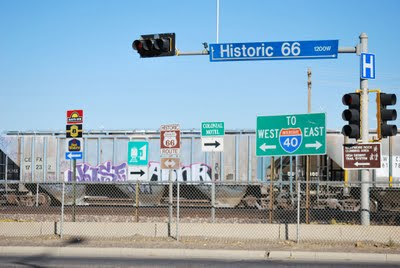 Along the way, you will see signs for "ATK." What could that be? It turns out to be the New York Stock Exchange ticker symbol for Minnesota-based Alliant Techsystems. 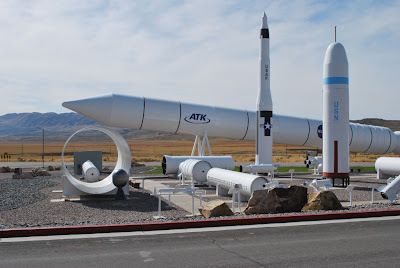 Their Thiokol rocket engine division is located here. 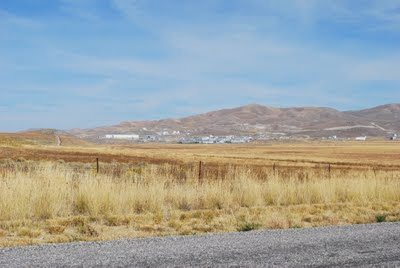 And as we returned to the highway from the Golden Spike Visitor Center, we could see the large Thiokol industrial complex in the distance. 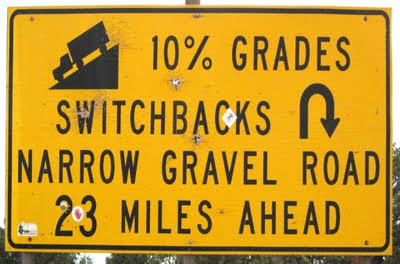 A sign noted "Rocket Display 2 miles." For a "space geek" like me, (I could tell you the weight of every satellite launched and the type of launch vehicle when I was in High School) this was like a Catholic getting to the Vatican. 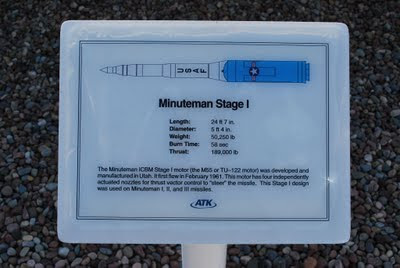 Minuteman, Shuttle Booster, Poseidon, Bomarc, Sidewinder. They were all there. Specifications are on signs, you can look at them from any angle. 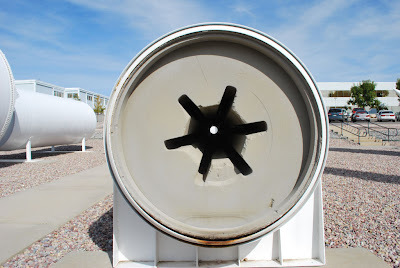 "No climbing in the rocket nozzles." But otherwise, have fun.